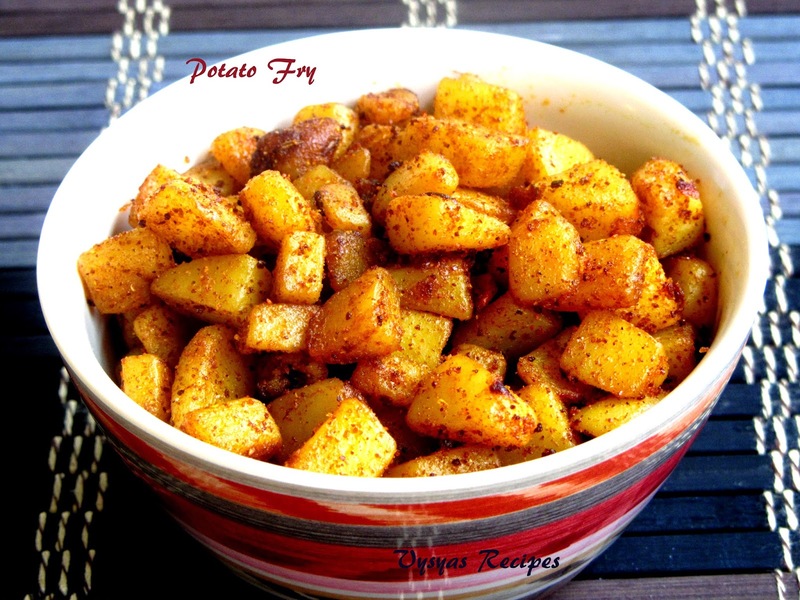 Potato fry is a simple fry recipe made with potatoes and spice powders. It goes very well with Andra pappu, Pappu Pulusu , Rasam and Dodajjanam(Curd rice). You could also have it with chapathi's and roti's. Its health benefits incudes, Potato can be used to relieve High Blood Pressure due to tension, indigestion etc. due to abundance of vitamin-C and B in it, but should be avoided if it is due to diabetes. The fiber present in it is helpful in lowering cholesterol and improves functioning of insulin in the body, which aids to lowering of blood pressure, since there is a direct relation between the blood pressure and the glucose level in the blood and insulin regulates this glucose level. Potatoes - 2 [Medium Size]. chilli powder - 3/4 tsp. Peel and cut the potatoes into cubes. Smash garlic and keep aside. Heat the oil, add Cumin Seeds, when it sizzles add diced potatoes. Saute in a Medium flame until potatoes becomes half cooked. you could cover it with a lid. saute now and then. when potatoes are half done add smashed garlic, add turmeric powder,chilli powder,coriander powder & salt.cooked it covered till potatoes are soft. when it becomes soft, remove the lid, cook it in a medium low flame for few minutes( nearly 12 - 15 minutes) till it turns golden brown at the edges, & it gets crispy texture. Serve with rice , roti and chapathi.